Frank J. Tullo joined the Air Force in October 1959, serving for seven years as a fighter pilot flying F-100’s and F-105’s including a tour in Vietnam where he was shot down on the outskirts of Hanoi and rescued by helicopter. Decorations include the Distinguished Flying Cross, Air Medal and Purple Heart. Capt. Tullo joined Continental Airlines as a pilot in 1966 and spent 33 years with them until he retired in 1999. During his career with Continental, he flew the Boeing 707, 727, DC-10, DC-9, MD-80, Boeing 757/767, Sabreliner and Lear jet. While at Continental, Capt. Tullo held the positions of: Flight Engineer Instructor, Flight Instructor, Boeing 727 Fleet manager, Director of Human Factors (CRM), Chief Pilot of Los Angeles & Honolulu, and Vice President of Flight Operations. He represented Continental on many Air Transport Association (ATA) committees including the Flight Systems Integration Committee, the Human Factors Committee and was the Chair of both these committees at different times. He was also was a member of the Flight Operations Committee. Recently, Capt. Tullo was awarded by the FAA Wright Brothers Master Pilot Award and have also authored Chapter 2 of the 2010 Second Edition of Crew Resource Management (Elsevier Publisher) . Capt. Tullo is currently a part time faculty member at California State University at Los Angeles, Embry-Riddle Aeronautical University extension and the University of Southern California. His education includes a BA from University of Maryland Overseas and a MS from Pepperdine University. Threat and Error Management applies to ramp, maintenance, dispatch, and aircrew operations. The course will introduce the concept of "Threats", those things that are the precursors to errors that may decrease safety margins in aviation. 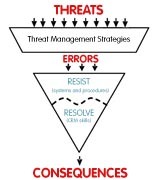 The TEM system uses established behavioral markers that will assist in creating "Strategies" that will prevent threats from leading to errors and negative consequences. Taught by a leader in TEM development, the course provides an applied, practical approach to explaining TEM principles. Threat and error management is an invaluable tool in the creation of an Safety Management System (SMS) and compliments any effort to identify hazards in an operation. The course includes many flight operations examples and experiences in addition to maintenance and in flight events. The objective is to provide class participants with sufficient knowledge to develop a TEM program within their respective organizations. This course uses a lecture format and reference material will be provided to the participants at the start of the course. It is not necessary to bring a portable computer for the course. Class begins at 8 AM. Tuition : CA$ 849.00. Space is limited, book early. Tuition includes all coffee breaks and both lunches served on site, wifi internet, parking, a 5 to 6 cocktail on the first evening with Frank Tullo, and all course material. A Comfort Inn Hotel is located just a few steps away. Several other hotels are located within 1 km. Book online by clicking below. Cancellations between 7 days and 48 hours before the course are refunded at 50%. Cancellations within 48 hours of the course and no-shows are not refunded. Course runs from 8 AM to 4 PM.